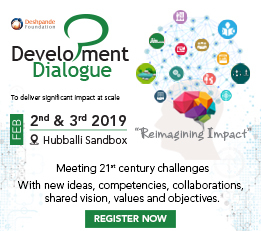 Applying a ‘bottom-up’ approach to build scalable solutions, the Deshpande Foundation India – Hubli Sandbox works to create an effective ecosystem where resources are put to use through entrepreneurship, innovation and sustainability. Located in northwest Karnataka in India, the Hubli Sandbox engages with not-for-profits, academics, organizations and entrepreneurs leading to the launch of effective and scalable models of development. Sandbox Action Partnerships: Through grant making programs we support a diverse group of organizations who are working in the arenas of social enterprise building, livelihoods, health, education and agriculture. We strive to launch effective, relevant and scalable solutions through investing in social enterprises. Inculcating Leadership among Communities: Through a wide array of leadership programs, we engage residents and youth in finding solutions to collective problems. Participants are encouraged to take ownership, lead through action, and initiate successive short term projects. LEAD is one such initiative that has successfully engaged with tens of thousands of students in the sandbox area. Building Entrepreneurs through Education and Mentorship: We employ several educational programs that prepare urban and rural youth to lead or manage social enterprises. These programs charter a new path for local youth to experience entrepreneurship first hand imbibing global standards of efficiency and excellence. Such programs address a grave need for skilled and motivated employees among social enterprises. In our pursuit to constantly deepen our efforts to translate entrepreneurship from approach to action, we engage with a variety of partners such as universities, academics, young entrepreneurs as well as the enterprises. Click here for more information on the Deshpande Foundation India operations.